Cold, blustery nights are setting in – now’s the time to ditch your light summer bedding and opt for something that will keep you cosy. But what to choose? Filled bedding products come with a number of different fillings which all have their own specific properties and can affect the quality of your sleep. Here’s a guide to some of the different types available. Today’s synthetic bedding ranges have been developed to offer exclusive benefits that are unachievable in natural fillings. The non-allergenic and washable properties of synthetic bedding ranges make for a practical alternative for those who are sensitive to natural fillings. This synthetic filling is a thread of fibre with a hole running up the middle. This traps air more effectively than a solid fibre and so makes a duvet warmer. Similarly the hollowfibre shape is harder to bend and so provides structure and loft in a pillow. These are naturally breathable and have superb thermal and insulation properties. Each natural-fill duvet has its own Fill Power Rating, which is a measure of the quality of feather and down. The higher the fill power, the better the duvet. This word describes the soft clusters found on the breast of a duck or goose. Down is very good at trapping air and so keeps you warm. It has no quill in it and so is very soft. The lightest and most luxurious duvets contain a high percentage of down. Feathers keep a bird warm without weighing it down, so they make excellent light fillings for duvets. Bigger feathers provide structure and support for pillows and mattress enhancers, and extra weight for duvets. Closely woven and smooth-finished, Percale is a by-word for luxury. 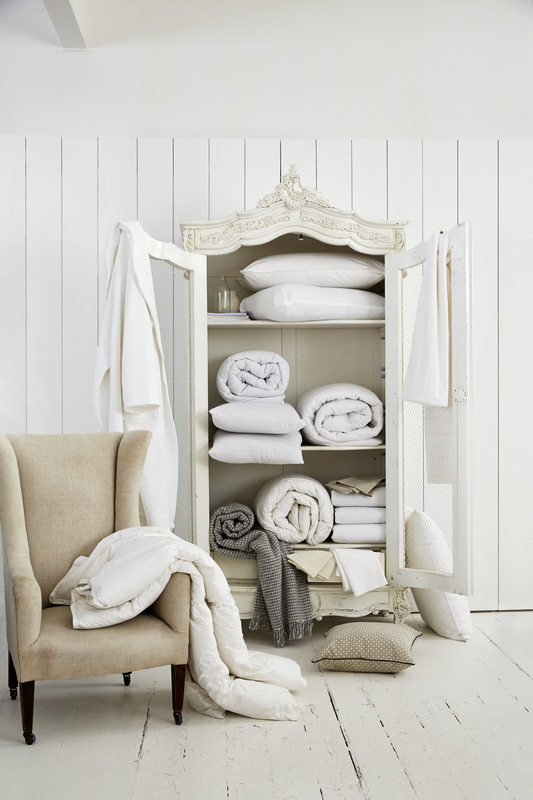 It has a high thread count, giving a cosy feel in winter and a crisp coolness in the warmer months. The Tog is a universal unit of measurement used to indicate the amount of warmth that a duvet provides. The higher the Tog, the warmer the duvet. However, when choosing a duvet, the Tog should never be considered in isolation. You also need to think about how warm your bedroom is on average, as this will have an effect on how warm you will feel in bed. While there is no set rule for identifying the best Tog rating for you, as a general guide we recommend a 13.5 Tog for winter use, a 4.5 Tog for summer use and a 10.5 Tog as the best all-round duvet. It is recommended that quilts for babies and young children above one year should be no more than 4.5 Tog. Use our handy guide below to help you shop. 4.5 Tog A summer-weight duvet, lighter and ideal for warmer temperatures. 10.5 Tog An autumn/spring duvet, with enough warmth to keep you comfortable without being too hot. A good all-round choice if you prefer not to change duvets by season. 13.5 Tog A winter-weight duvet designed to retain body heat on colder nights. This entry was posted in Talking Ocado and tagged advice, batural filling, bed linen, bedding, down, Duvets, feather, goose down, guide, hollowfibre, homeware, Ocado, Ocado deliveries, Ocado groceries, ocado.com, percale, pillows, shopping, Shopping at Ocado, synthetic, Tog rating, winter bedding by Ocado. Bookmark the permalink. this site is actually good and the users are truly sharing pleasant thoughts. Down is my favorite! I love down everything, duvets, pillows even though I am without-a-pillow sleeper. Down is just comfortable. I don’t have a specific duvet for each season. Yes, I have all season duvets. It just not much of a trouble. If it gets colder I can always turn the heater to a higher temperature. Oh and I opt online shopping for my bedding, less trouble! Down is the soft undercoating of geese and ducks. It consists of clusters of light, fluffy filaments growing from a central quill point. A single down looks similar to a dandelion pod. Feathers are the plumage or outer growth of birds. Feathers consist of a hard quill shaft (or stem) with a series of fibers extending from each side. Between down and feathers I prefer down. Fortunately I have no allergic to down, and love to use down. I choose down feathers from geese since using this down as a filling, the result is a super light and soft. For me down is a very good moisture regulator. Goose down duvet from texelana.nl is using down from geese that are well treated and do not use down from live plucked geese. Hence I have no worry with the quality. Why is there no 7 or 8 tog? I find 4.5 too light even in summer and 10.5 seems quite a big jump. We are sorry for the disappointment, Ross. This is just our guide but hopefully, we’ll have something more suitable for yourself in the future. – Christian. We bought a Fogarty hollowfill 7.5 tog earlier this year, still have it on the bed though may soon change to a 10.5.